I am a cast away. I am lost and have been for some time now. Once upon a time, i shared a rocking lifeboat with you. And then came a day when you told me I needed to get out. I did so, but felt as it I were tossed out, because you chose to sail on without me, feeling as though I must be lost to you forever, rather than keep your vow to stay by my side and help me through whatever came our way. You told me you had had enough of sharing that space and need your own. You said you’d added up the days of sitting by side and decided when it was time for me to go. And so, I struggled, but I let you know, I’ve never let go. You only hung on in the one place you would not admit there was still a chance I might find my way back aboard. And even as I hung on, you encouraged me to let go. You behaved as if me hanging on was holding you back. And yet I hung on, clinging, refusing to let go. And you refused to move even an inch toward me to bring me back in. I wanted to spend the rest of our lives in our lifeboat. Sail the high seas with our family until we could sail no more. I’ve come as far as I can without your help. I need you to move toward me to get me back aboard. I cannot do it myself. It takes two. I wanted nothing more than to forget the choppy sea. And yet all you threw in my face was more of the same old water. You doubted I could hang on, and said so. You didn’t encourage me, and in fact discouraged me. I let my passions be known, I did not let go of them, nor you. And yet you refused to yield. You never took stock of how far we had come together. You only reminded me how far I had gone outside the lifeboat. You said it changed me and refused to help me back inside. Never admitting how much you had changed from someone who shared their seat to someone who saw only room for you and our kids. You changed from someone who cared about all of us to someone who cared about all of us except for me. Today I told you, there are other lifeboats out there. Maybe one of them is for me? I reminded you, I want nothing else but to be beside you, but just like last night and yesterday and all the other yesterdays, you only see the hurt you feel and the old water between us and never consider what I need, just that you are not satisfied. I thought, will you ever be? Will you ever see that I have never let go? Despite how being in the water has changed me, right down to my fingers and toes, how the years of piled-up insults and recriminations and reminders of my shortcomings have hurt me, could you ever move just enough to help me back aboard? I know you are hurt, too, and I thought we could help each other heal those wounds. But I wondered whether you would let that part still clinging to me overtake your own doubts and memories of what’s in our past and give me your hand? Or will you let me drift here until I finally am unable to hang on for even another day? You’ve said you need time to think about it. I’ve said I have needs, too, and it’s time for you to show me that one of your needs is me. But again, and again, and again, what you show me is that you will sail along without me unless I find my own way back into your lifeboat, on my own. You feel assured that you’ve done enough, even though we both know, it takes two. And it always has. I shared with you a story that touches my heart, about how even after a husband goes beyond what it takes to be together, how his love for the woman who refuses to move even an inch costs him everything. How much I feel that this is our story, too. And how the woman in the story saves him by finally seeing him as he is, not as she thinks he is. And how I feel I am losing you because you cannot see beyond your own version of who and what I am. And you say all you take away from that story is that it’s depressing. You don’t see deeper meaning. It doesn’t affect you deep down like it does me. You only see the surface, like the old water between us. 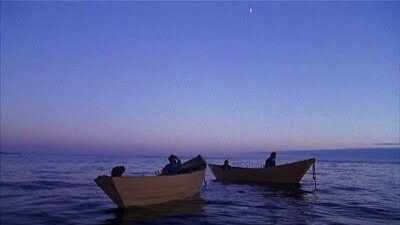 You don’t even see a lifeboat for all of us, just for you and our children, and you let me go. Still you make not one move to bring me back in. I hope perhaps I will find another lifeboat, but all I want is for that vessel to carry me home. But you instead see me as “once again” abandoning you. As I drift away, alone. Cast away. If I find another lifeboat, I know you will only see it as further proof of your suffering and what you perceive as my abandonment. You would never see that I came as far as I could without you, and that you made your choice by sitting still, taking time, and leaving me outside. If you choose to look away, and not consider what happens to me to be relevant to you, I will drift away toward uncharted waters. After all, it was you let me go. So much hurt, so much punishment, all for struggling alone for as long as you could: a lifetime, until you simply could not go on. Then to turn on you and say “you” have abandoned “her” seems, well, if not selfish, certainly unfair. I am so sorry you have to go through this, Dawn. I know what it is like. This could be my story, too, though in my case, the abuse had gone on for so many years beforehand, that when I finally did let go, mostly what I felt was relief. It will get better. It may take months, or even years. The anger and the pain will fade, (though never completely disappear), but your life will get better. You will build it, piece by piece, friend by friend–perhaps there will even (eventually) be love. We don’t know what that new life will look like–not precisely–but it will be beautiful and full of joy, I promise you. Others–MANY others–have done this. I have done this. You can too.